Local SEO has never been as important as it is in the current times. While location based SEO was always something that was a part of the optimization exercise, the kind of special focus and attention that it has generated in recent times has led to special efforts being directed towards leveraging it for maximum gains. In this article we discuss, how in the context of local SEO, better visibility and online presence can be achieved by businesses. Some tips and guidelines are being offered on how to implement processes and strategies to get the most out of location based results. Thanks to the attention it has been getting form Google in the last year, local SEO has seen come to the forefront in a big way . In the past it was more of a domain that was restrictively being explored by smaller and medium sized businesses. That trend is changing fast. Local SEO has grown exponentially in relevance and importance even in this past given year and there are two big reasons for that. One is the fact that more and more searches are being conducted on mobile devices now and in that context, location is a big factor. The second is the fact that Google itself has been giving a lot of importance to organic local results even for desktop searches. So, the big question is- how does a business leverage this trend? What are the steps that can be taken in order to gain visibility and maximize online presence? 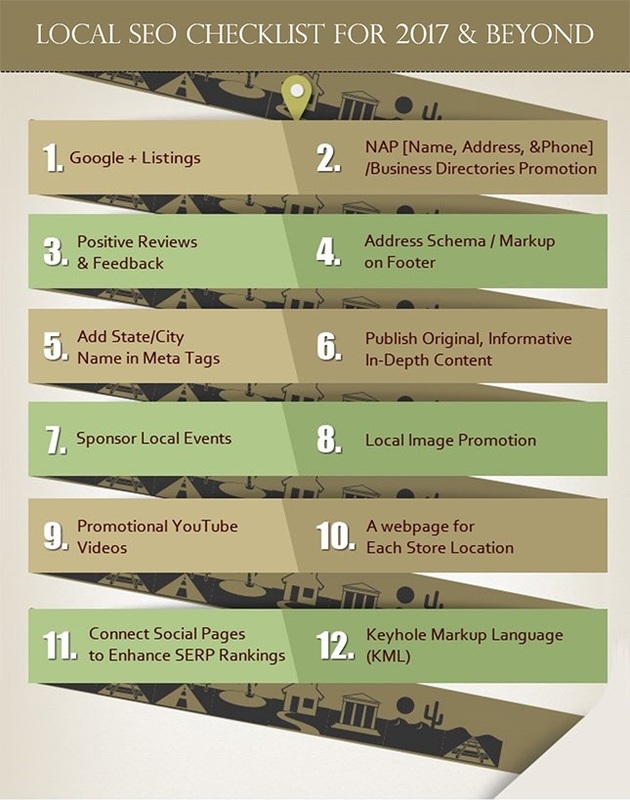 Below we’ve compiled 12 point local SEO checklist that is beneficial in 2017 and beyond. 1. Google+ Listings – One of the easiest steps that can be, in fact need to be taken, is to have a Google+ local listing, which increasingly is no longer an option. Having a Google+ Local listing will tremendously boost your online search visibility and is exactly what Google uses for map driven local search results. 2. NAP [Name, Address, & Phone] /Business Directories Promotion – One of the most significant steps that need to be taken for greater visibility is to make sure that your contact details i.e. NAP information is correct and very specific, both, onsite and as well as externally at other places like business directories etc on the web [Learn here about- Techmagnate’s Local Business Listings services]. The idea is to establish a clear and strong relationship between the business and the location they would like to target. The searches conducted for local businesses tend to be more specific. When a person is searching on mobile, they query that they put in is more location specific and keeping that in mind mobile searches have to be more comprehensive in their optimization. It is imperative that a clear and working phone number accompanies your search result so that a user is able to reach out to you immediately. 3. Positive Reviews and Feedback – Reviews and feedback go a long way in establishing the credibility and visibility of your business online. In fact entering a review for your business is a feature that a number of online directories are offering nowadays. Search engines are fond of reviews and use them for additional weight when ranking your site. 4. Add State/City Name in Meta Tags – This part is pretty self-explanatory, but deems repetition. Remember to use local keywords as part of the content and Meta tags on your site. Trust us, it’s common sense. 5. Address Schema/Markup on Footer – Mentioning your location in the text of your site or even possibly adding your address to the footer and tagging it with the relevant schema/ mark-up will help. 6. Publish Original, Informative In Depth Content – So clearly, the content bit is not going away. Content isn’t an intangible, amorphous cloud that’s quickly finding a place in jargon. It’s a means for you to provide real solutions and value for your audience, and is equally pertinent for your local SEO efforts as it is for your other SEO and Digital Marketing activity. After the Hummingbird update, meaningful content is fast becoming a more consistent and weighted factor for local SEO. Remember to answer the Who, How, What, Where, When and Whyaspects in all of your writing. Also, add links to your internal pages for more detailed information. So, clearly, it’s back to the basics, folks. Clarity in communication and great writing skills will help you get much further ahead than most of your technical skills combined. 7. Sponsor Local Events – Isolation never helps, and for business, it only spells disaster! Consider sponsoring or being an active participant of local events in your community. Why take the pain? Well, it has a twofold benefit to it. The prime being the strong network that you create for your business and of course the secure links that your business obtains from the local businesses, the press and media therein, that comes complementary. Oh yes it does entail investment of resources (time, manpower and money) but it pays off eventually! 8. Local Image Promotion – A great source for links and citations can be social media sites that lend weightage to images and photographs, for instance, Facebook, Pinterest, Flickr and perhaps even Instagram. These sites carry a healthy amount of influence with regards to rankings (think ubiquity) and offer an opportunity for brands to gain an edge over their competitors. Get more tips for Images Promotion and optimize your images for better local SERP ranks. 9. Promotional YouTube Videos – Businesses generally invest in an informative video that makes people aware of their evolution and services. A think-out-of-the-box idea would be if you could publish a series of videos that would show the kind of work you do and how you do it. Ensure you highlight the unique practices you adopt to make your services score better. The benefit? While the gains may not be tangible at the onset, it would help showcase your business’ expertise and may land you many prospective leads that would willingly pay you to get the work done. Get more tips for video and why to start video marketing for better local SERP ranks. 10. A webpage for each store location – Businesses could have multiple store locations within a city or in different cities. Google’s Matt Cutts suggests separate web pages (URLs) or a single page with links to the different store locations be created for many or few outlets respectively. A separate URL for different store locations will help consumers find store specific information with ease. Additionally Google’s crawler can index the pages separately too. 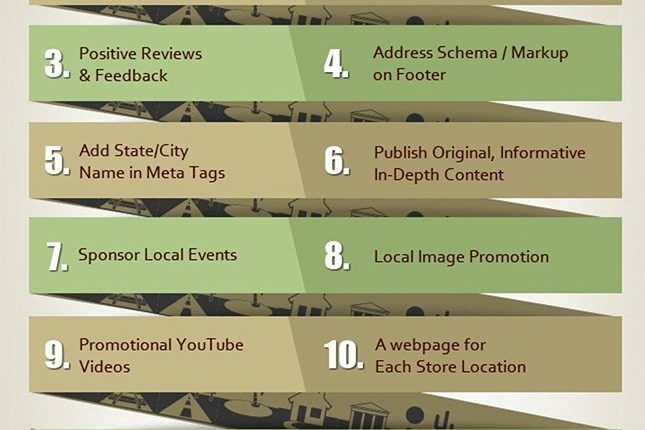 Get more tips to promote multiple stores for better local SERP ranks. 11. Connect social pages to enhance SERP rankings – Though Google has denied the effect of popularity on Facebook and Twitter in SERP rankings, it still works well. If you have a high Facebook and Twitter following, and if you get them integrated on your website, your SERP rankings are bound to progress. Off late, proactively involving on Google+ especially, can highly improve search rankings. 12. Keyhole Markup Language (KML) – Feature your business locations on Google and Bing Maps by using the KML file format. As a rich data source it not only points to your operation units but also add value and credibility to your brand image. Get step by step tutorial for KML implementation and submission in Google Webmasters Tool. Businesses don’t become global overnight. It has to begin from the smaller community to the larger (global) community. Local SEO is important if you want to ground your roots firmly. Its only when people around you know you well, that the information gets disseminated further.